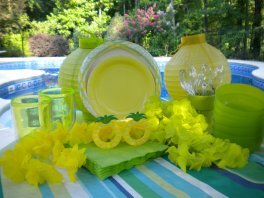 Pool party themes provide direction and creative ways to entertain and decorate whether it is a pool birthday party for kids or an adult pool party. 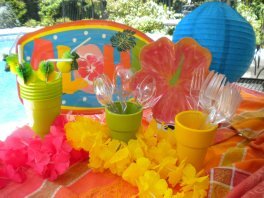 Some themes lend themselves better to just girls, like a flip flop party, others for boys, like a pirate party and still others for everybody - like a luau party. What makes a pool party even more fun is to have floating pool toys that go along with your party theme - like a ride-on shark for a shark pool party or an inflatable octopus for an under the sea party. Kids pool party ideas can transport children to the wild animal watering hole or to an under the sea adventure. Party invitations, napkins, plates, lights, cakes, games and favors carry the theme from start to finish. 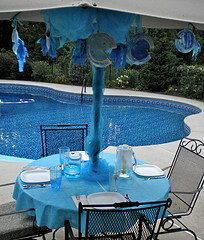 Decorating your pool party becomes easy and fun when there is a theme that provides direction and colors. Girls were all a'flutter with their wings and pinwheel flowers. A butterfly scavenger hunt and a dive game for butterfly rings made the day truly memorable. Of course sunshine and 85 degrees helps alot. 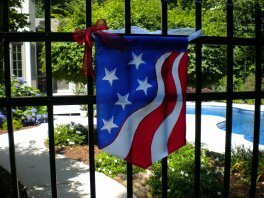 Decorate the pool gate and place butterflies on low hanging branches and on top of shrubs. 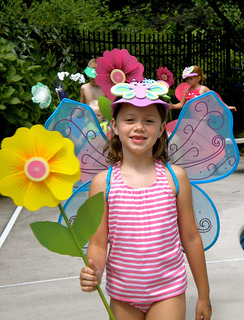 Before getting into the pool, start out with a Butterfly parade. Let the birthday girl pick out her favorite song and play it using an outdoor ipod player with speakers. A pirate birthday party will get all the young boys excited about coming to your party. There is an abundance of inexpensive pirate wear so that each of your guests can dress up like a pirate with an eye patch and a pirate hat. 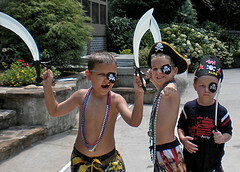 Treasure hunt games and pirate flags carry this pool party theme for the games and decorations. A Flip Flop Party gives a lighthearted summer feel for all ages. Because there are so many decorations, party supplies and games it makes for an easy themed party. Send out easy to make flip flop invitations or free e-vites. 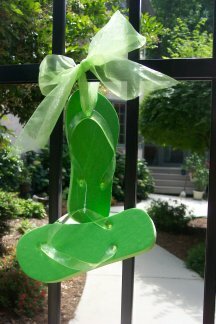 Let your guests know that there were be some great prizes for the cutest flip flops or the ones that have traveled the farthest. Flip flop lights to flip flop plates and banners, you can carry this theme from start to finish with a flip flop flag to greet your guest to flip flop candles to give as favors. 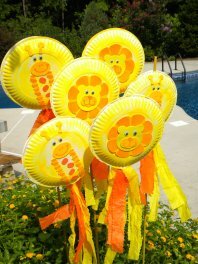 When it comes to summer, what better pool party theme can you have than a beach ball. You can start with invitations. Buy small blow up beach balls from the Dollar Store- inflate them and then write out the details of the party with a permanent marker and then deflate. Put them in a larger envelope and send. Use blown up beach balls as decorations around the pool and for some fun pool games. Looking for pool party ideas? Consider an Under the Sea party. Make your own Under the Sea Party invitations and party bags with an assortment of fish, dolphin and sea coral foam shapes. Rescue Ariel from the sharks and swim under water through Nemo spring hoops. A jungle party theme appeals to both boys and girls so this is a great pool party or birthday party theme if both genders will be invited. Older kids can go on "safari" with a scavenger hunt or dive for plastic wild animal toys. Younger kids can make wild animal masks to take home. Get out the tiki torches, buy leis for your guests, put on some Hawaiian or Caribbean music, serve frozen tropical drinks and you've got the perfect tropical party. For an evening pool party, place bamboo tiki torches around the pool entrance or perimeter. The bamboo torches provide the feel of a Hawaian luau and some nice pool party lights. Every year we host a 4th of July Pool Party. Our house is the gathering spot after the morning Fourth of July parade. Since it is so hot in Georgia, the pool is the best place to be. Stars and Stipes pool floats and beach balls great guests when they arrive and entertain guests through out the day. Find out what we do to host our annual celebration.